One more example of Advanced PSD Add-on usage is rendering PSD files and customizing raster and text layers. Such functionality may be useful if you need to create several images based on the same template with different content, e.g. business cards, advertising booklets, postcards, etc. 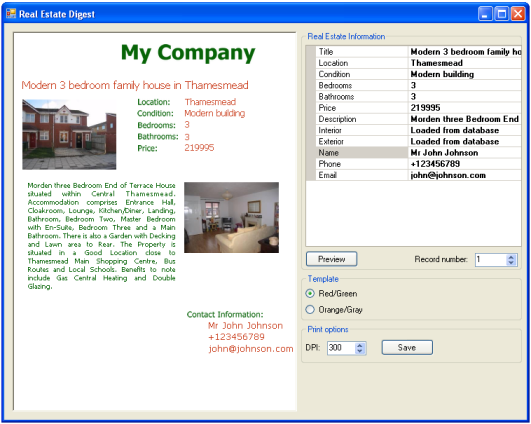 This article discusses the Real Estate Digest sample application which creates advertising booklets. It stores realty details in the internal database and uses this data to create booklets. The user can preview a booklet using the BitmapViewer or save it with the specified dpi as well as change some text or image information and choose a template. Note that the application provides a read-only access to real estate data and all your modifications will not affect sample database. The main functionality of this application is implemented in the PsdRenderer class. Let us consider it more detailed. The DPI of the result image. The resulting bitmap represents an image where layers of the template are customized with new content and merged in correct way. New content for raster and text layers is specified with BitmapReplacerInfo and TextReplacerInfo classes, respectively. The TextReplacerInfo class specifies new text value. The BitmapReplacerInfo class specifies new bitmap to render and two additional placement parameters - ImageFitMode and ImageAlignment. CropToFit Crops the image. The crop area is centered. ResizeToFill Resizes the image so that it fills the whole placeholder, even if the resulting image is larger than the placeholder. The aspect ratio is preserved. ResizeToFit Resizes the image to have the same size as a placeholder (preserving the aspect ratio though). The image is resized even if it is smaller than the placeholder. ShrinkToFit Resizes the image to have the same size as a placeholder (preserving the aspect ratio though) only if the image is larger than the placeholder. If the image is smaller, it is not changed. CenterBottom Aligns the image by the center horizontally and by the bottom vertically. CenterCenter Aligns the image by the center horizontally and by the center vertically. CenterTop Aligns the image by the center horizontally and by the top vertically. LeftBottom Aligns the image by the left side horizontally and by the bottom vertically. LeftCenter Aligns the image by the left side horizontally and by the center vertically. LeftTop Aligns the image by the left side horizontally and by the top vertically. RightBottom Aligns the image by the right side horizontally and by the bottom vertically. RightCenter Aligns the image by the right side horizontally and by the center vertically. RightTop Aligns the image by the right side horizontally and by the top vertically. Create new instance on the PsdRenderer class and use its method Render to create a preview version with 72 dpi and printable one with 300 dpi.